Longtime leader in commercial and industrial grade lighting equipment Larson Electronics has announced the release of an Explosion Proof LED Aluminum Drop Light. Constructed to be completely impact and weather resistant, this LED drop light sacrifices no light output or quality to obtain these features. The FTL-5-LED-ILC-50 LED drop light from Larson Electronics is ideal in practically any environment including general maintenance, construction, aircraft interior, emergency shelter, long narrow pathways, and shipyards. The LED lamp in these drop lights offer much longer lamp life, cooler operation, higher durability, and better light quality than incandescent drop lights. This LED task light is shock resistant and is durable enough to withstand drops, falls, and rough handling. The FTL-5-LED-ILC-50 is equipped with an LEDT8-28W-V1 T8 bulb that produces 2750 lumens of light and requires no ballast to operate. The lightly frosted lens diffuses the light and makes this bulb ideal for food safe environments as there is no glass. The aluminum housing serves as a heat sink and provides rigidity and strength for this LED bulb. The handle and the end of this task light are finished with a polyoxymethylene plastic. This multi-voltage LED drop light runs directly off any voltage ranging from 110 volts to 277 volts. 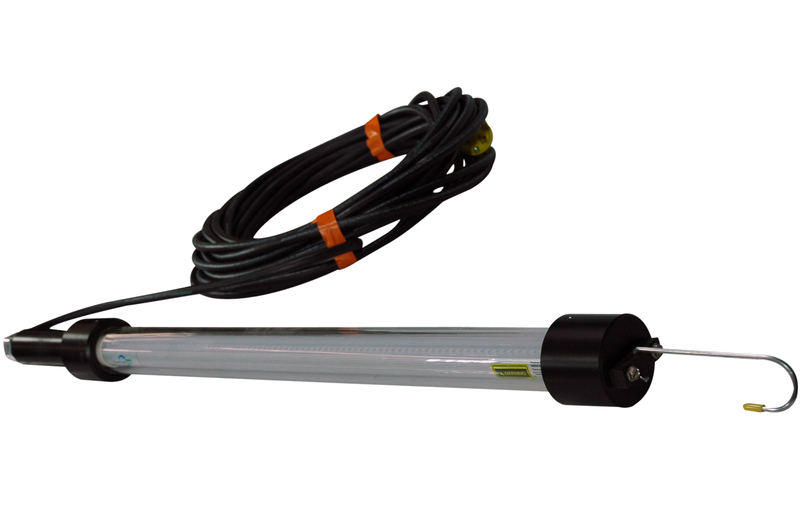 It is equipped with 50 feet of cable, making this drop light versatile and provides the operator with plenty of length for moving the light around the work space. This drop light comes standard with a set of drop hook that allows the operator to conveniently hang the unit overhead anywhere illumination is needed. Each light is equipped with a 5’ whip terminated in a female connector to allow end to end connections. Larson Electronics carries an extensive line of LED lights, LED work lights, light towers, portable work lights and industrial grade LED area lights. You can view Larson Electronics’ entire lighting inventory by visiting them on the web atLarsonelectronics.com. You can also call 1-800-369-6671 to learn more or call 1-903-498-3363 for international inquiries.